These notes accompany a in-depth feature on Austria. For profiles of all of these estates please see Regional report: The wines of Austria. The higher volume blend, made from grapes from various vineyards in the region, but all organically grown. Lovely peppery Grüner nose, dry fruit skins and good apple aromas. A little yeasty, biscuit richness. Lovely mouth-filling stuff, lots of texture and juiciness, good tart acidity and nicely rich. No sulphur after fermentation. 12.5%. 6.20 Euro locally. 87/100. Named after the mussel shells found in the soils of the vineyard. This is a poor, dry soil hated by farmers but loved by quality wine growers. Quite a deep emerald green colour. Beautiful nose adding a touch of fig but also of something racy and mineral and citrusy, with a lovely freshness. The palate is more tight, refined and long, not quite so abundantly fruity but has that lovely bite of bittersweetness. Something a little flinty too. Else Zuschmann thinks this will cellar five years plus. 13% 9.5 Euro locally. 89/100. The loam soils gives a fuller wine, and this is also made from the latest harvested grapes. This one in a Burgundy bottle with cork (others in screwcap and Bordeaux bottles). Lots of ripeness and depth here, a touch of quince a touch of fig. Battonage and full malolactic. The palate has lots of richness, ripeness, but it is the yeasty, battonage weight and dry richness. This has loads of grapefruit and lime and savoury spices, the pepper and the texture are intriguing. 13%. 12.5 Euros locally. 90/100. The Schricker Bergen sub-region is cool and very good for Sauvignon Blanc and Gewurz. Sauvignon Blanc vineyards are planted on east facing slopes so the sugar does not develop too much. Very nice aromatics, more towards the tropical side, with touches of gooseberry, and lemon. The palate is bone dry, with a big thrust of cirrus and just hints of lychee and mango in the background, the finish precise and mineral with a salty lick. 7.9 Euros locally. Peter Schöffmann says “We make around 5,000-6,000 bottles, which for us is enough – it is a hard sell internationally and locally, but I planted it because I like it – it’s 5,000 bottles, which I can drink myself!” 87-88/100. The “hell” vineyard, planted facing south, gets very hot in summer, planted on gravel and clay. This is from as very old clone of Zweigelt. This is aged in small barrels, but very old. Lovely dry nose, dry kirsch and cherry skins, a deep, dry inky prune quality. There are tiny floral nuances. This is bone dry on the palate, that searing core of tight tannins and acidity, but lovely definition, the pure, dry black fruit persisiti8ng. 13%. 8.5 Euros. 87-88/100. 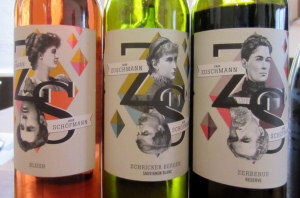 70% Zweigelt, 15% each Cabernet Sauvignon and Syrah, with around 15% new oak and the rest in older oak barrels. Really lovely nose, it has some earthiness and some smokiness, with lots of peppery spice and a little lift of game and mint. The palate has lovely fruit – floods nicely across with tight, black fruit and the lean, dry, gamy and racy finish has an inky dryness but lip-smacking freshness too. 13.5 Euros. 89/100. Single vineyard south facing, the soil is loam and gravel, and vinified in open fermenters and then into used barrels. They have just planted with seven different Pinot clones, six form Burgundy and one from Italy, but this is from one Burgundy clone. Lovely delicate ruby colour, the nose is soft, gently coffeeish stuff, delicate earthiness and a dry red fruit quality. Lovely soft and inviting stuff. The palate has delicious medium bodied finesse, with a real juiciness, a very refined tannins structure and just a rounding hint of chocolate. Lovely balance with the fresh acidity. This has fine brackeny briary notes. 15 Euros. 91/100. Entry level wine, not exported. Has lovely fresh and crisp aromatics. Nice gentle nutty leesiness, has good richness and fresh but fruity palate. Lots of apple citrus. Long. 86-87/100. Orange peel and lemon rind, that citrus skin and melon skin richness. Again a nuttiness to this and developing toasty notes. Lovely ripe fruit from vineyards facing the lake, all planted on limestone. Lovely fruity richness, texture and grip. Beautifully focused lime skin tang to the finish. Delicious and long. 89-90/100. See all stockists on wine-searcher. Leithaberg DAC wines cannot be single vineyards, but must be representative of the region, approved by tasting committee. This has more than three days on skins and is fermented in barrel and left on lees for four months. Even richer and grippier, the nose has a touch of the orange blossom lightness to offset the concentration. The palate has huge juicy, grapefruity presence. There is a natural sweet ripeness here giving huge intensity. 91/100. See all stockists on wine-searcher. A bigger site that encompasses five vineyards. Mostly loamy soils with iron. Rich, ripe black fruits, there is some spiciness, some tobacco and warmth, but the blue/black fruit is all there. The palate has delicious sweet fruited ripeness, with blackcurrant and intense black damson plum, the chocoalty depth of the tannins and good spicy character adding to the modest but nicely balancing acidity of the finish. 89-90/100. See all stockists on wine-searcher. A really cool vintage. Slightly more fruit came from slate soils in this vintage whereas a little more would normally come from limestone for freshness. Ripe, lightly gamy nose, plenty of nutty black fruits, plenty of earthiness and gentle herbs and game. The palate has a lovely rounded, dry but very well defined palate with such a juicy squirt of tart black fruit skins to the acidity and firm tannins. 90-91/100. Fortnum & Mason, see all stockists on wine-searcher. A really hot vintage. The limestone cools overnight and makes slightly more reductive wines. Much more rounded and opulent on the nose, the thicker, plumier dark fruits. On the palate it has such fat, sweet fruit and huge concentration. There is a warmth and solidity to this that Georg thinks in four or five years this will come good, the primary sweet fruit will subside a little then. And I can see the game and the herby quality in there that is just a little overshadowed by the thick plumpness of the fruit at present. 91-92/100. See all stockists on wine-searcher. First bottling was 2011. From limestone soils, but harvested a little later. Made in 500-litre casks of Austrian oak. Big, chocolaty nose, with thick, rich fruit. Some spice and pepper and a little gamy note. But this is about earthy and chocolaty richness and conentration. Savoury, with the briny seashore note and wonderful juiciness. Has plenty of acidity and really intense feeling to the tannins that grip the wine now in that savoury umami character, the intense full and spicy fruit is in there, but this has massive structure and concentration. 93/100. See all stockists on wine-searcher. From slate soils. Difference here is whole berries. Much lighter, ashier, earthy and floral notes, lots of cracked black pepper and crisp black and red berries – suggests more lift and energy. The palate has such an intense sweet fruit purity, the intensity and concentration is immense, and the palate has lovely finesse and lively, fine intense concentration. The tannins are very svelte, the acidity juicy in a wine that is arguably a little more straightforward, but makes up for that in its perfect purity. 93/100. See all stockists on wine-searcher. The name means ‘field blend’, from old mixed vineyards of Pinot Blanc, Welschriesling, Muskateller, Traminer and other varieties. Very pleasing, fresh nose of apple and a touch of something peachy, with gentle herbal, delicately nettly notes. Lovely palate: silky smooth texture, with a little bit of grip and tannin, very good acidity. Fresh citrus and orchard fruits give energy and a clear lemony, salty, mineral finish. Grown on slate, rich in iron too. Only 1% is matured in small barrels, the rest in steel. 88/100. This and the red wine below sell locally for around 9€ for a one-litre bottle. Plenty of deep colour, with lovely big meaty, gamy nose, lots of dry, full black fruit of bramble and spice and a touch of earthiness. The palate has plenty of sweet fruit, but also that big sour, raft of acidity, that touch of salty mineral quality, the black fruit intensity is good and the tannins are really quite smooth and grippy. 50% on slate and 50% on loam clay. 1600 litre barrels for one year. Spontaneous fermentation. 88/100. A wine that came about “after a discussion of what to do with all the stuff that was planted in the 80s and 90s – the Cab and Merlot.” In fact it is 30% Zweigelt, the rest made up of Syrah, Merlot and Cabernet Sauvignon. The international varieties matured in barrique and 500 litre barrels, the Austrian in 1600 litre casks. Lots of cedary, elegant finesse, with some bloody notes and again the dry bloodiness of the Zweigelt marrying nicely. On the palate good energy and life about this, a liquorice and cedar edge to the black fruit and that nice tart, sour cherry acidity cutting through. Some good spice and a touch of chocolaty sweetness adds more balance. Really delicious stuff. 88-89/100. 12.90€ locally. Only from vineyards that are 30 years old or older. 100% Blaufränkisch, bottled one month ago. Starts in equal portions of barriques and big casks, then into 500 litre barrels with tops removed. Really deep and glossy stuff, the purity of the fruit is so deep and fine, a blue/black intensity, licked with mocha and chocolate, plummy and deep. The palate has that lovely lick of saltiness again, the energy and the edge that is deliciously fresh, but married to the deep fruit and spice, concentrated and layered. Long and finishing on fruit extract and spice, that twist of cherry and plum skin to give a bittersweet quality. 92/100. 29€ locally. Released December 1st. Another expression of Blaufränkisch from a vineyard 500 meters away, planted only on slate and from a slightly cooler site. Made only in the big 1600 litre barrels. Very fine mineral and graphite nose, a little more ashy and mineral, lovely pepper and spice, but refined and has less fat than the Saybritz. Very linear and dry on the palate too, driven by the cool core of blue/black fruit, something more steely about it, something that reveals itself more slowly. Terrific steel at the core of this, graphite and long and deliciously refined. 93/100. 29€ locally. “This is the wine to drink in the Buschenschank with a cold cut,” according to Hannes (a Buschenschank is an informal restaurant). With only 11.5% alcohol it has a fresh pear nose, lots of zip and apple freshness. Nice and dry and fresh, lots of crisp and clean flavour. 85/100. STK = low alcohol, stainless steel and for early drinking, but will be rationalised to “Steirische Klassik” for this variety too from 2013. 6.30€ locally. Or Pinot Blanc. More time on lees, and some time in big old casks. “I hate residual sugar and carbon dioxide in this style.” Certainly has more leesy, yeasty character, a little bready note to the nutty apple fruit. Very clean very citrusy on the palate. The ripe clean apple and melon comes through, more substantial fruit and persistence in the finish, lovely acidity and bone dry. 86-87. 8€. Very nice, clean, classic nutty Chardonnay nose, with an undertone of peach, but more about cool nutty apple fruit. The palate is clean and fresh, a nice medium body with juiciness, fresh-cut apple and a squirt of fresh lemon juice in the finish. Grapes from two single vineyards. 12 months ferment in large used oak. Gamlitz is the village where the vineyards are, a legal classification as in a village wine in Burgundy, but very few producers use it on labels. 87-88/100. Hannes thinks it will store for 5 to 7 years. 11€. Single vineyard Pinot Gris, 18 months on fine lees in big old casks. A warm vintage here, so the wine is pretty big, Hannes thinks it needs 3 or 4 years. 14% abv. Big, rich and exotic stuff, the smokiness of the Pinot Gris, the little honey and fatter, more tropical fruit tempered by cool apple. Big and hugely sweet fruit on the palate, this is a big wine with a spicy, full finish. It doesn’t show the heat of the alcohol too much, but perhaps a little extra acidity would have been good. Loads of flavour and fruit though, and that gentle smokiness. 89/100. 17€. Coppery colour, lovely gently nutty and oxidised stuff, with a touch of custard and a full palate, lots of honey and crystallised fruit, that core of apple again, but the acidity back in balance more from this hot vintage. It has the streamlined, more energetic finish. 91/100. Available to drink in the Buschenschank. Has a very nice touch of the fruit skin grip and the gentle herbaceousness of the grape, a hint of apricot too, but very fresh. 20 – 40% natural yeast ferment, but the other cuvees only natural yeast. The palate has lovely orange juice freshness, lots of tang but the cool, lean mineral dryness. A little rounding weight. 87-88. 9.30€. Made in used old oak casks, all spontaneous fermentation, from two single vineyards, 70% gravel and sandy soils in Kranachberg, 30% Limestone in Jägerberg. There’s a nutty hint of richness to this. A burgeoning hint of peach and nectarine, but the ripeness is there, hinting at passionfruit. Lovely sweet fruit, with a real juiciness, a squirt of apple acidity but that tropical fruit always hinting in the background. Long and very nicely focused a touch of mineral saltiness. 90/100. 15€. 18 months on fine lees in big barrels, from the single vineyard Kranachberg. Terrific nose: quite big, smoky, nutty and rich, the fruit cool and tempered, like sweet melon and apple, but again there’s a hint of passionfruit coming through. The palate is quite rich, with real tang. The oak does give a nuttiness, but it is the freshness that still impresses. The light oxidation, minerality and nuttiness is delicious – somewhere between Bordeaux and the crisp minerality of natural wines. Punchy citrus in the finish really lifts this. Maybe not for everyone, but fascinating and excellent. 92/100. 21€. Fantastic, custard apple nose with more oak possibly? Hannes later confirms it was in a newer barrels, but the wine also went through malolactic. The palate has delicious tropical-edged fruit with hints of pineapple and nectarine tropicality, a touch of green bean, but then that lovely core of dry mineral and lemon rind acidity comes through, this is drinking so well, with precision and a but of fat and generosity. 92/100. Lovely floral and herbal notes, lots of old roses lift, lots of fragrance. A little terpene character of greenness, and a touch of Turkish delight. Here the majority is from the limestone soils. Only 12.5%. Big, dry palate, the zipping freshness of the acidity and the cool precision of the mineral flavour. This is about steely, lime and lemon freshness on the palate and is delicious. Hannes says it goes really well with beef, “opposites attract”! 88-89/100. 13€. There is no UK importer for Weingut Harkamp at time of writing. Hannes was kind enough to present a vertical tasting of every vintage he has made since beginning five years ago. This has only around 5g/l dosage, but is otherwise the same wine as the ‘Zero’. Seems a little creamier on the nose, but the palate is just as racy, just a little sweetness to fatten the finish. 89-90/100. Developing more biscuit and yeasty notes, still clear apple fruit character, the fruit on the palate super sweet and ripe. There is a clear, fresh finish with lots of juicy, lime-like tang in the finish and a pleasing saltiness. 88-89/100. There is ripeness and lightly smoky, lightly vanilla notes with a touch of nectarine given more ripeness and fullness. The palate also has a powerful fruit body and character. The sweetness seems more apparent here, but mostly from the fruit rather than dosage. 88/100. Lovely racy character here, a touch of earthiness and racy lemon and apple. Gentle yeastiness. Long, dry and a point, the racy freshness and mineral quality is delicious. 90/100. Made mainly for the hotel, for weddings, from Müller Thurgau and Sauvignon Blanc and only 11.5% abv. Nicely aromatic, very fresh and racy, lots of citrus and a nice elderflower freshness, plenty of tangerine and orange tang. 85-86/100. Made in older barriques. Smoky, creamy cherry and bramble and a touch of charriness, nice briary, a lightly curranty character just a touch overripe perhaps. The sweetness of the fruit plays against a tiny charry note from the oak. Tannins are refined, the modest acidity marrying with spice in the finish. 87/100. Notes from a tasting of wines from the top producers of the Carnuntum region, east of Vienna. Very few of these producers have UK distribution currently. Vineyards in Carnuntum. Click photo for larger version. Lovely herby, floral nose, big, bold and punchy. Delicious flavours, sappy and fresh with a long citric tang. 87/100. Gently tropical aromas, a touch floral and touch leafy. Soft green herbs and good freshness on the palate, feels just off-dry. 86/100. Much more aromatic, green and vibrant aromas that are crunchy and pungent, with a more grassy, lemony palate that is dry, mineral and serious. 88/100. Winemaker Johannes Trapl joined me for the tasting and commented that this wine comes from schist and granite soils and is made with “a little bit of foot stomping,” in old oak vats. A touch reduced, a touch flinty too, nice complex sulphide character. The peppery quality comes through, quite full and rich with lots of grapefruity bite. 90/100. Leafy, green, floral and fresh, this is also open and inviting with apple fruit punch and lots of fruit, if not a great deal of complexity. 85/100. Robert Nadler also joined me to taste and confirmed that next year he would make this as a reserve wine, with longer ageing before release. There’s a nice yeast-derived richness to this, with spice and pepper before a really racy, dry palate and good finish. 87-88/100. Fresh and fruity, lots of apple and lime zest, hinting at riper peach. Straightforward stuff, but very good. 86/100. Lovely rich nose of herbs and lime peel, lots of apparent grip and tang. Big orange and lime blast on the palate with a long, nutty finish 88/100. A 50/50 ferment in barrels and cask, followed by four months in barrel. Nutty, appley, with a big punchy core of citrus before a racy and really quite fine finish. 87/100. Flowers and herbs are strewn across the nose, a touch of mint leaf lift too. On the palate a big sour hit of citrus, lots of fruit and a crisp finish. 87/100. A rosé from Zweigelt and Merlot, with a soft peachy colour and spicy and nutty aromas. Dry on the palate, there’s a nip of tannin here in a firm, racy style of rosé. 86-87/100. 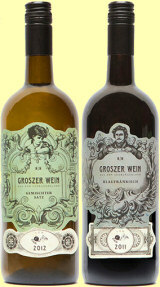 All ‘Rubin’ wines are made from Zweigelt and all sell for approximately 10 Euros per bottle in local wine shops. A lively and leafy red, with lots of spice and just a touch of reduction. Nicely fresh and racy on the palate, good fruit. 86-87/100. Nice black fruit core and a subtle gamy character. Lots of black fruit juiciness on the palate, the freshness and racy, crisp dryness is appealing. 88/100. A touch reduced. A touch of bonfire smoke. Nice, ripe, solid black fruit beneath, rounded with a sense of plum and cherry acidity. 12 months in used barriques. 87/100. Seems nice and ripe, with lots of creamy black berries. Has good concentration and spice, it is dry, but there is a pleasing softness to the finish. 87-88. A 50/50 blend of new and used barrels. Beautifully fresh and quite lifted aromas, cherry brightness. Racy and fresh on the palate too, again cherry drives this with subtle oak. 88/100. A little chocolate and spice here, ripe and perhaps a little more oak. Lovely cherry and black berry fruit, long with soft but persistent tannins. 88-89/100. Just a little bit of rubbery reduction, but then thick black cherry ripeness comes through, a kirsch-like lift here and solid black fruited palate. 88/100. Racy, fresh, not so openly fruity as some, more linear, more sinewy. Quite a serious edge to this though arguably lacks the easy charm of some. 87/100. Again a little note of reduction – not sure if this is a particular aspect of Zweigelt – with a nice cherry fruit coming through, quite sweet and opening into black fruit. Spicy, poised and tasty on the palate. 87-88/100. Complex, juicy and earthy nose, good fruit too and a juicy edge to the palate, ripe with blackcurrant and plum, freshness and zing too and a nice touch of tannin. 88/100. From a single vineyard, aged in new and used French oak. A very bold colour here and a lovely soft cherry aroma, a touch of spice and chocolate. The palate beginning to open, but a liquorice edge allied to fuller plum fruit. 88-89/100. Nice pale colour, though the nose seems quite big and ripe, with an appealing gamy quality. Meaty and spicy Pinot on the palate, which is filled with fruit and finishes with a sense of freshness. 90/100. Made from the early ripening St Laurent, this has a dry, fresh, herb and cherry nose and spicy, savoury palate, crisp, fresh and nicely pitched. 87/100. Intriguing nose, green and leafy with a graphite quality, a real herbal lift. Very nice balance, black fruit and spice and a good sense of energy. 89/100. Creamy oak, black fruit and a little meatiness. Juicy and spicy palate, this is rich and full. 88/100. Grown on gravel soils, 25% was aged in new barrels. Really ripe stuff, with a touch of tobacco to the thick black fruit, plenty of spice. Mouth-filling, with tight tannins and good structure. 89-90/100. This is Blaufränkisch again, that is immediately juicy and sophisticated, lots of ripeness but a sense of finesse too. Sweet fruit on the palate, smooth and creamy, plush but precise. 89-90/100. From old vineyards of Blaufränkisch, this is very fine, solid and ripe, with meaty black fruit and a herbal touch. Lots of concentration here, touches of menthol, but it becomes so elegant, so tight and racy. 90-91/100. 62-year-old Blaufränkisch vines, the wine is naturally fermented and aged 18 months in barrique. More ripe blackcurrant here, vanilla and smokiness, but there is something crunchily fresh about the fruit. Deliciously ripe, mouth-filling but tight, real thrust into the finish. 92/100. Rich, full and bloody on the nose, it is also plummy with a touch of leather or tobacco. On the palate it is plump and open, plenty of fruit but dry, stylish tannins. 89-90/100. A blend of Blaufränkisch, Zweigelt and Merlot there’s creamy richness on the nose, with black chocolate and deep fruit. On the palate dark, juicy stuff, touched by liquorice and has a peppery character, long and fresh in the finish. 90-91/100. 50% Zweigelt with Merlot and Cabernet Sauvignon. Minty and chocolaty, this seems very ripe. Lots of juicy quality, but savoury, long and serious with a bit of structure. 91/100. Zweigelt, Merlot and Cabernet Sauvignon. More spicy, but with a real green olive character, the palate shows real sweetness of fruit, plush tannins adding depth, but finishing with racy freshness. 90/100. A blend of Petit Verdot, Malbec, Merlot and Cabernet Franc. Lifted, spicy, green-tinged and also nutty, this is immediately complex with plenty of fruit and freshness. Fabulous sweet fruit on the palate, but has such lovely agility and drive into a long finish. I guess it could be marked down on having no indigenous varieties, but it is terrific. 93/100. Zweigelt, Merlot and Cabernet Sauvignon again, there’s an animal note of game and meat here, a hint of green, then a dry, juicy and even mineral finish. 88-89/100. Zweigelt, Merlot, Blaufränkisch and Cabernet Sauvignon. Big, deep, sinewy stuff, with plenty of ripeness and full creamy weight on the palate. The palate tightens up nicely thanks to precise tannins, in a big and more modern style, but I like it. 91-92/100. Zweigelt, Blaufränkisch and Merlot. A touch of game, good juicy fruit tinged with green, a little coffee and chocolate from oak. Rich, deep and full on the palate and drinking well. 90/100. This is 100% Cabernet Sauvignon. Gamy, animal richness and earthiness along with plenty of ripe black fruit. Juicy and super-sweet fruit on the palate, this is solid and not hugely complex, but spicy and full stuff. 89-90/100.